Your first stop should be to the IRS website, which is thankfully much less opaque and much more navigable than the tax code it covers. Here, you can download and print the various forms and schedules you’ll need to complete and file. As such, this is the least expensive option for filing taxes, costing little more than postage and a few hours of your time. It is also the riskiest. Even if you’re just filing a basic 1040EZ, the chances of calculating an incorrect sum, failing to enter the correct ID information or attach the proper schedule are very real and could result in an audit if you’re not careful. That’s a lot of risk for the average taxpayer to bear, which is why the IRS Free File program was created. 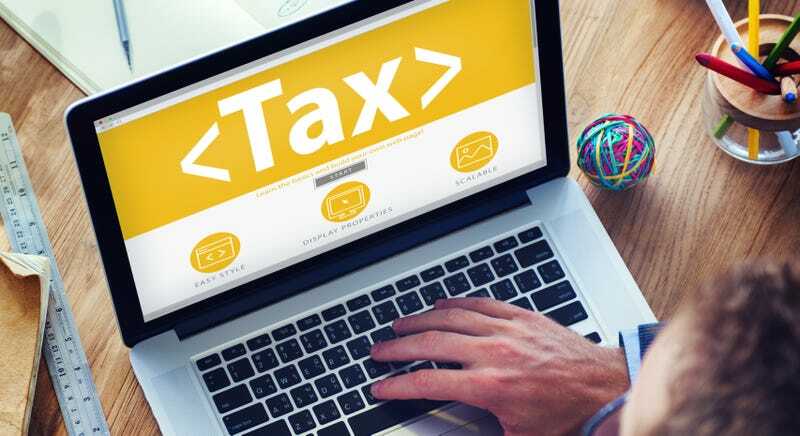 The program is a free service funded by a public-private partnership between the IRS and commercial tax software companies like TurboTax, H&R Block and others. It’s free for all taxpayers making less than $58,000 annually—that’s nearly 70 percent of the US population, according to IRS figures. To see which preparation apps you qualify for, head over the IRS’s Find Free File software page, or view all 14 Free File partners with their individual restrictions and requirements here. Be warned, some preparation companies do carry their own restrictions including limits on joint income as well as charging additional fees for filing your state state return. Also, some restrict their service based on age, while another proportion may also use your state of residence, necessary forms, and military status as criteria. As with all things capitalistic, the free service you receive is generally the barest-boned version that the company is allowed to market. The upside is that this is still very useful to a lot of people. If, for example, you are single, have no dependents, make about $40,000 a year, rent your home, and are filing a single W-2, you probably don’t need to pay a dime. If you’ve filed your taxes with the same preparer in previous years and don’t feel like reentering the data, you might want to spring for a slightly upgraded version that allows for information importation. Or if you are married and have kids, a mortgage, investments, or a ton of deductions, you’d do well to spring for a more deluxe package that is either looked over by a real accountant before submitting, or provides some other form of integrity check is a good idea. The Free Federal Edition service from Tax Act is among the least expensive—and least restrictive—of the major online services, offering free federal e-filing and $20 extra for state filing for anyone ages 18 to 57 with a maximum adjusted gross income of $52,000 living anywhere in the country, as well as citizens with foreign addresses. The free service also includes multiple automatic verification scripts, dubbed “Examiners,” for your deductions, credits, and income calculations. It will even help you file an extension if you need it. The next step up, the Deluxe Federal Edition, allows returning customers to import their ID information, includes a donations calculator for folks trying to write off their charitable giving, additional Examiners and calculators for major life changes that may have occurred over the last year (death of a spouse, joining the armed forces, etc). This service costs $15, but you get $10 extra for state filing with DELUXE state filing, for just $25 total. The Ultimate bundle is also $25—the service is $18 and the state filing is gratis. It includes everything the lower iterations do as well as free phone support, which otherwise costs a one-time fee of $8 for the 2012 tax year, and a litany of guarantees. Why not just get Ultimate, since it costs the same as Deluxe? Good question! It depends on how put off you are by unnecessary bells and whistles. Sometimes, less (confusing) is more (helpful). Turbo Tax is the largest online tax service in America and offers five levels of service, with federal returns running from free to $105 and state returns from an average of $40. Its free offering charges nearly double that of Tax Act for state filings, but does include free live chat tax advice, the ability to automatically import your W-2 information directly from more than 400,000 participating employers and financial institutions—meaning no more manually entering figures—and the ability to file your 1040EZ in as little as ten minutes. It will even give you a 10 percent bonus on your Federal refund if you agree to take it in the form of an Amazon gift card. The Deluxe package costs $55 for federal filing plus another $40 ($95 total) for state but offers step-by-step guidance, information importing (both your personal info and your W2 info from participating employers), and access to previous years’ forms. The Premier, and Home & Business packages above that offer improved deduction and donation calculators, and are designed for people with more complex tax liabilities such as landlords and the self-employed. eSmartTax is a very inexpensive service as well, charging only $23 per state filing. Unfortunately, the service only handles 35 states. The free version does also offer free information importing, free live chat support but does not support itemized deductions. You’ll need to spring for the $25 Deluxe package for that. H&R Block is the second-largest online tax service in America behind Tubo Tax and offer pricing and plans roughly inline with them. The Free Edition includes automated prep help, deduction and credit checks, a free federal e-filing, and one free session of live chat or email tax advice. The $40 Basic Edition also includes information importing and a step-by-step guide wizard, while the $50 Deluxe is geared towards home owners and allows users to import tax information and receive additional help with investment income questions. The $75 Premium service, on the other hand, is designed for people with complex incomes such as rental property owners or the self-employed. State filing costs $30 under the Free Edition and $40 under the others. If your annual income exceeds the government’s $58,000 limit for using Free File software, don’t worry. While you won’t be able to use the free services described above, the IRS does offer Free File Fillable Forms. These online tax return forms offer a modest amount of automation in that it will check your math, but doesn’t do much more than that—such as help you with filing your state return. This is a decent option for people that steadfastly insist on doing their own taxes, but if you’re making this much money, chances are you’ve got properties, investments, and other sources of income that make professional tax preparation worth the cost. It certainly beats getting audited. If your annual income is below $52,000 or you are at least 60 years old, the IRS offers a pair of free tax prep assistance programs: the IRS Volunteer Income Tax Assistance (VITA) and the Tax Counseling for the Elderly (TCE) Programs. The VITA program offers free tax help to people who make $52,000 or less and need assistance in preparing their own tax returns in the form of basic income tax return preparation with electronic filing. There’s no guarantee that your volunteer will be a proper CPA, however the VITA program does train and certify its volunteers on preparation methods and applicable credits like the Earned Income Tax Credit, Child Tax Credit, and Credit for the Elderly or the Disabled that the low-to-moderate income families might not be aware of. The VITA program is currently in operation and will be all the way up to Tax Day. To find a VITA site near you, head over to the VITA Locator Tool or call 1-800-906-9887. The TCE program offers much the same service but geared specifically for senior citizens over the age of 60. These IRS-certified volunteer preparers receive additional training in pension and retirement issues and according to the IRS website, largely consist of “retired individuals associated with non-profit organizations that receive grants from the IRS.” Read: AARP. In fact, most of the TCE sites are operated by the AARP Foundation’s Tax Aide Program. To find one in your town, check out the AARP Site Locator Tool or call 888-227-7669.